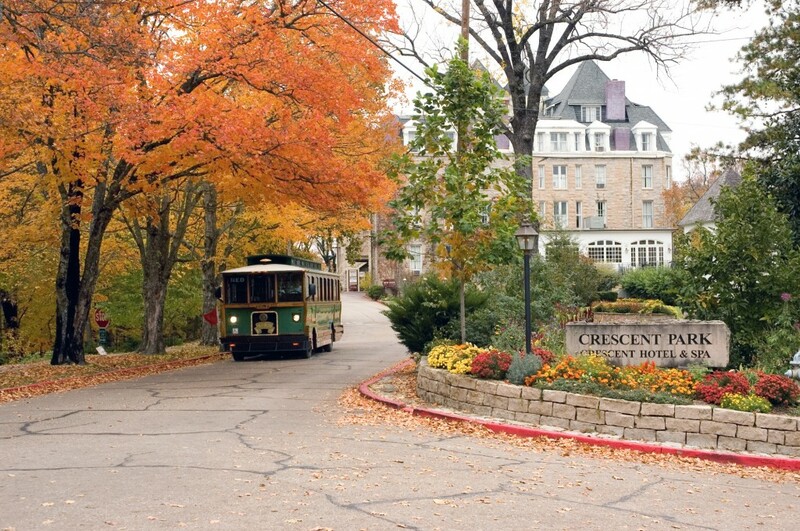 Fall For Eureka Springs… It’s Color-full! Every fall in the Arkansas Ozarks, two things happen. First, the leaves of the hardwoods covering the majestic hills and adjoining hollows morph from emerald green to the fiery hues of orange, violet, gold and red. Second, seasoned travelers who enjoy seeing this colorful transition up close and personal go in search of a cottage that places them right in the middle of this seasonal segue. The mountain village of Eureka Springs is well known for accommodating visitors looking for satisfaction on both points with the bonus of unbeatable weather and plentiful events and attractions. Crescent Cottages are neighbors to their sister property, Lookout Cottage Estate, in-town upscale cottages that are secluded and each with its own unique and historic ambiance. Both are located within simple walking distance to the historic, main structure of the Crescent offering guests the reciprocal opportunity to enjoy all in-hotel amenities like the restaurants, New Moon Spa & Salon, daily resort activities and the famous Crescent Hotel Ghost Tour. However, the cottages are tucked away far enough for guests to enjoy the peace and quiet of a hidden mountain hideaway. For those guests who enjoy a woodland adventure right outside their front door, both Crescent Cottages and Lookout Cottage Estate are located adjacent to the newly opened Harmon Park Loop, a 1.4-mile loop trail for hiking and mountain biking. The Harmon Park Loop connects to the city playground, its dog park, and links to the city’s master trail system including Lake Leatherwood City Park. For rates or more information on Crescent Cottages, Lookout Cottage Estate and other similar lodging properties in the greater Eureka Springs area, one may go to CrescentPark-Arkansas.com or EurekaSpringsOnline.com .